And see what adventure the crew of the U.S.S. Enterprise had landed themselves in that week. I loved James Tiberius Kirk's we come in peace - take charge attitude backed up by a team that excelled in their individual roles but came together in a way that transcended their designated rank as - the whole is greater than the sum of its parts. 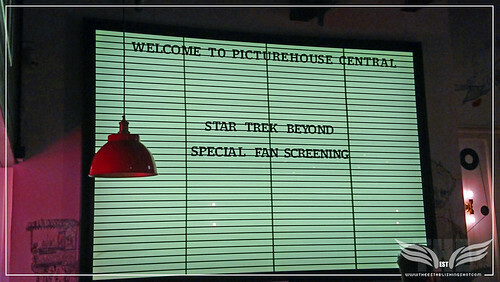 I quite enjoyed the original Star Trek film series, I say quite enjoyed, as the tone of my appreciation for the series may have been set early on at my first pre teen viewing of Star Trek: The Motion Picture - after much anticipation and build up to see the film, in a key sequence as the Enterprise made its way through the dazzling light effects of V'Ger's nebula - I fell asleep in the cinema. In fact it's happened almost everytime I have tried to watch the full film. Star Trek II: The Wrath of Khan is my favourite of the series for its grittier (in part due to the delays and drawn out process to create the special effects for the original - if you are a fan it's worth reading up on the story behind how FX genius Douglas Trumbull ended up creating the effects for Star Trek: The Motion Picture) as well as its obvious high action and thrills content. 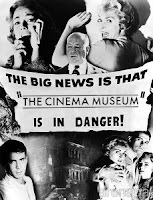 As the tale of Star Trek: The Motion Picture unfolded it proved to be ahead of the curve in bringing this type of story to the large screen - there was nothing else like it in Sci-Fi at the time. Yet I fully appreciate Star Trek's approach has always been different from the mainstream as it pioneered and carved its own way building a universe with characters that may be vastly different they are never mindless killing machines. My love of Star Trek was renewed in the early 2000s with the cancelled before its time TV show prequel - Star Trek: Enterprise. Again adhering to all the principles and tropes I loved about Star Trek but with added emotional depth as the character's lives, the love of exploration and man's progression were part of the show's fabric and appealed to my older self. So perhaps it is no surprise that I absolutely loved J.J. Abrams' update and reimagined 2009 Star Trek which was an innovative action packed space adventure giving depth to the story and the characters I love, as the crew of the Enterprise coming together for the first time. As well as the sheer awesomeness of every aspect of the film, a big part of what I loved about it was how it nodded to the roots and origin of the original Star Trek. With J.J. Abrams' sequel Star Trek Into Darkness it became a case of, not would I enjoy the film but how much would I enjoy the film? As I loved it almost as much as his first film. 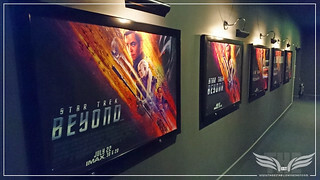 Although I wasn't wild about the fast editing and pace of some of the scenes particularly in the run up to the climax the development of the characters, but the engaging tale and Benedict Cumberbatch's complex Khan more than over compensated as it all came together in a wonderful spectacle and a great popcorn film. 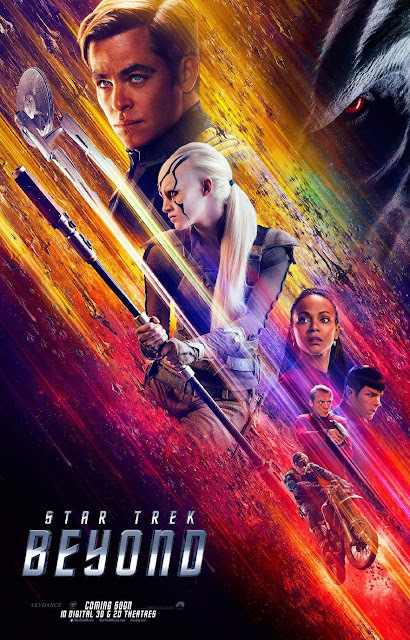 an engaging tale of space high jinks crackling with wit written by Simon Pegg and it introduces Sofia Boutella's Jaylah who I fell in love with almost immediately - but I felt it was a little weaker than the previous two films. Whilst it felt more episodic and harked by to the TV show it seemed a little, well, formulaic meaning it had a very similar structure to Star Trek Into Darkness but with the old rule of sequels - escalate the risk. Again I felt that the fast pacing/editing felt out of place and dominated the film pushing the personalities out of frame. There is a lot of important personal stuff happening with Kirk, Spock, Mccoy, Uhura and even Krall. 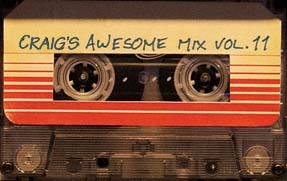 Some of which seems to be hooks to be picked up and continued further in the series (please?) but it's muted. Another casualty of the overarching pace is that - well, the sense of awe in space exploration and grandeur of being able to travel through space is lost. Throughout all the Star Trek I have enjoyed the space travel element has always been treated with respect and wonder but seems to be replaced with kineticism. Hopefully moving forward the insight into the characters day to day personalities and development won't be marginalised in favour of action as I love both of these elements just as much as each other. 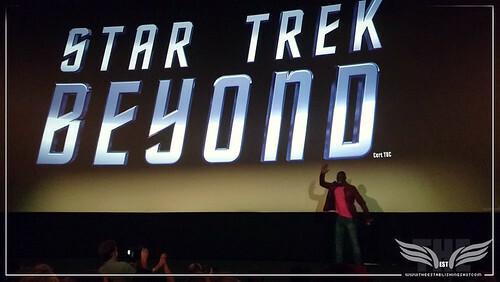 All of which brings me to the special screening of Star Trek Beyond at the Picturehouse Central we were lucky enough to attended - especially when Idris Elba turned up to introduce the film see his inspirational introduction below. Sadly I was not allowed to use my camera so had to use my Sony Xperia Z5 to capture the photos and video. 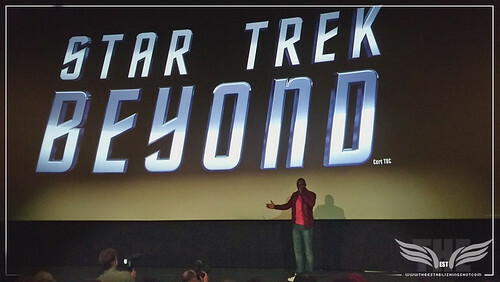 Justin Lin's Star Trek Beyond is in UK cinemas now. 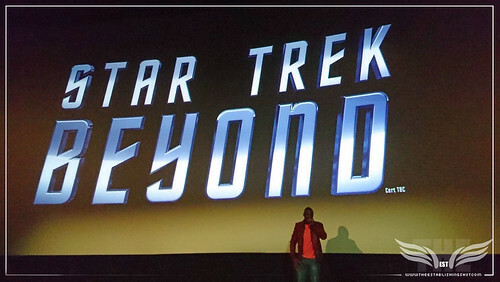 "Star Trek Beyond", the highly anticipated next installment in the globally popular Star Trek franchise, created by Gene Roddenberry and reintroduced by J.J. Abrams in 2009, returns with director Justin Lin (“The Fast and the Furious” franchise) at the helm of this epic voyage of the U.S.S. Enterprise and her intrepid crew. In “Beyond," the Enterprise crew explores the furthest reaches of uncharted space, where they encounter a mysterious new enemy who puts them and everything the Federation stands for to the test.